226-page reprint, from the 1919 book, How To Do Things. 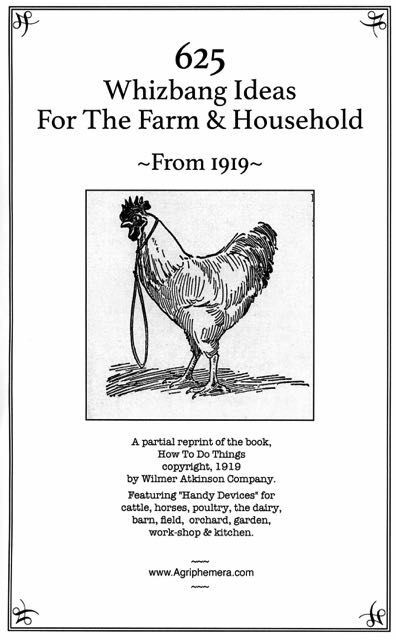 Back in 1919, "The Farm Journal," a popular agricultural periodical of the day, published a book with the bland title, "How To Do Things." The book has 226 pages with hundreds of illustrations and problem-solving ideas. The collected ideas in this new-old book are a lot of fun to look at, read about, and consider. They were all appropriate at a time in history when precious few farm folks had electricity or engines, and all the conveniences that came with those revolutionary inventions. It’s also worth noting that the old-timers of 1919 also did not have plastic. The farms of those days were diversified subsistence farms operated with horsepower. Thus it is that many of the ideas presented in this book are not directly applicable to today. But there are some that can certainly be adapted and put to good use on a modern homestead. Besides having some useful ideas for today’s homesteaders, there is the “inspiration value” that comes with studying all the cleverness crammed into these pages. If you are a resourceful person with an inventive mindset, reading this book is sort of like priming the pump; ideas, after all, tend to beget more ideas. And then there is the historical aspect. The tendency is to breeze through the many pages in this book and look at the pictures. But, after you have done that, if you go back and read the descriptive information presented with each idea—even the ideas that don’t seem particularly interesting—you’ll discover all sorts of details about life, and livestock, and farming in the old days. From the perspective of nearly 100 years, not every “handy device” presented in these pages is a “home run” idea, but there is plenty to learn and appreciate in this excellent resource.